Bushnell Tripods come in a complete selection of camera-quality tripods to provide a solid foundation for viewing at higher magnifications. The Bushnell Tripod universal head fits all compatible spotting scopes, binoculars and range finders. 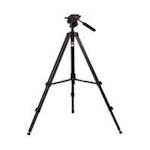 Bushnell tripods comprise a wide range of products from full-sized models like the 63-inch Advanced Titanium model and the 61-inch Advanced Tripod. The tripod/window mount is a tabletop model that offers that additional flexibility.